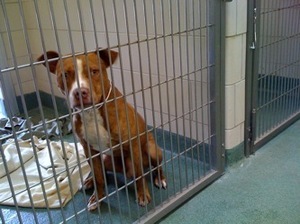 At any given time in the Stray Dog area of the Santa Fe shelter, there are plenty of pit bulls. Today is no exception. Against the back wall in the middle block, a well-fed male-female pair with matching leather collars peer at me from behind bars. 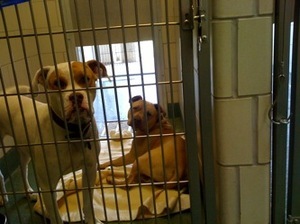 They were found roaming the streets together, and indeed it makes sense to house them in the same kennel. They are clearly bonded to each other, and judging from the calmness in their eyes, an older couple. Their next door neighbor is another pit, a puppy, with enough energy for all three dogs. He knows "sit"–even managed to hold still and do so for a moment while I took his picture. Which leads me to believe he was (is?) somebody’s pet. For the life of me, I don’t understand how any companion animal spends more than a few hours as a stray. Where are the owners? Isn’t the local shelter the first place you’d call if your dog was missing? And no, the fact that they’re pit bulls has nothing to do with the story. There are Labs, Chihuahuas, shepherds, mixed breeds of all flavors, and even a pug in the stray building today. I just feel awful that the pits will spend more time here, waiting a lot longer to get adopted, and it’s by no means their fault. Stories such as this upset me to the core. With as many rescues out here and loving and doting animal lovers over the world my mind can’t understand why this is such a huge problem. I am aware of life and the circumstances that come along with it however, reading, hearing and seeing it firsthand still breaks my heart. These animals want to be love and give love yet many of them are forced to live and die in overcrowded shelters. As I have mentioned before it wasn’t until I became a pet owner as an adult did I realize the magnitude of the problem. So many cases, not enough spaces, not enough money and many innocent lives lost. What bothers me the most are how pit bulls are labeled, misunderstood and MISREPRESENTED in every aspect and because of this they’re the ones that are lost in the system. It’s not their fault they were born a pit bull, it wasn’t a choice of theirs yet they are banned, discriminated against and flat out hated because of a few knuckleheads. Whatever happened to punishing those that do wrong and being a voice for those that don’t have a voice or better yet what happened to not judging a book by its cover? 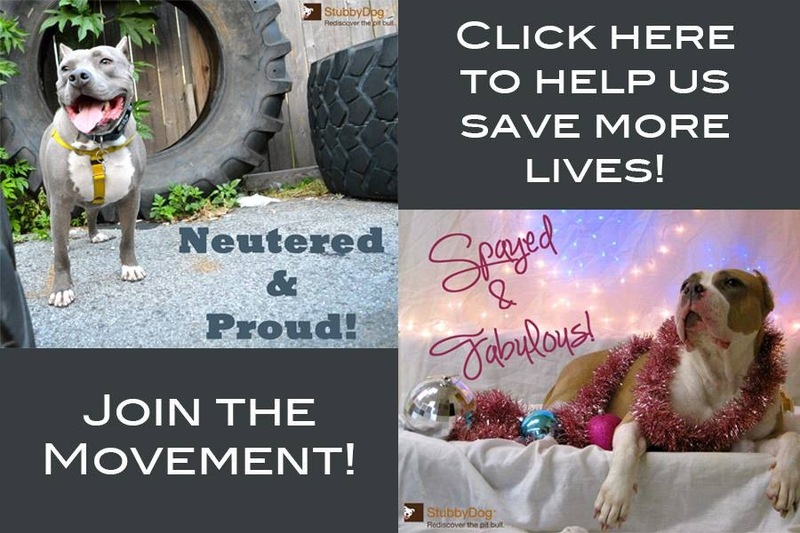 Thank you to Stubbydog, all rescue organizations, volunteers and responsible pet owners!